Welcome to Day 9 of my #100DaysofBulletJournalIdeas Project! This is a pretty handy collection to have as a reference for your grocery shopping efforts. Simply look over it while making your grocery list to see if you need to pick up any incidentals. Sometimes we forget to pick this or that up, with this list you'll be more likely to get all the things you need. I'm sure that this idea has been around for longer than the internet has existed. 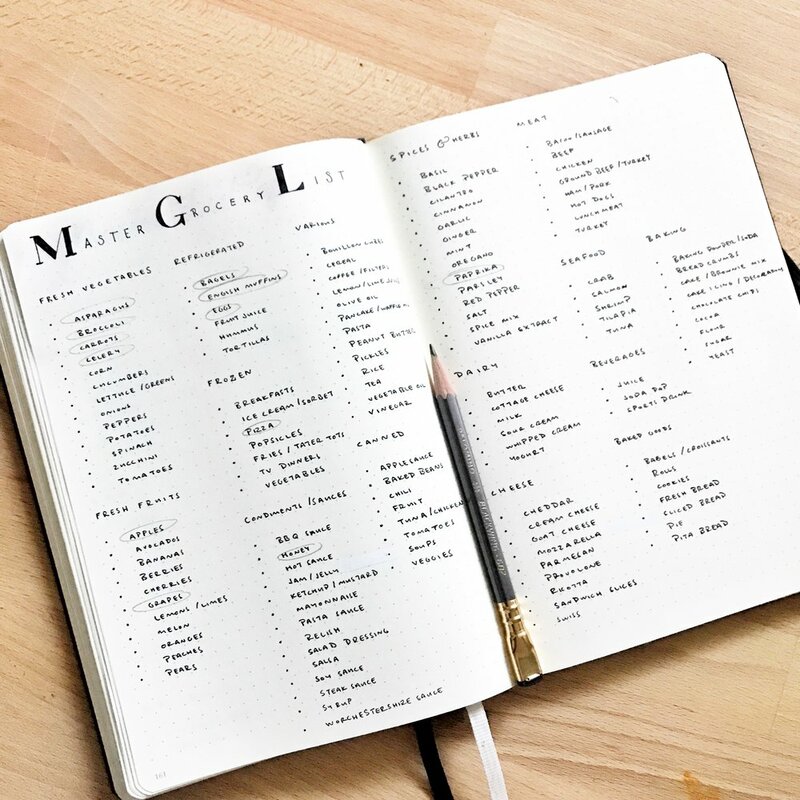 I moseyed over to my favorite master grocery list resource to print out their printable and put a line all the items that weren't relevant to my life so I could create a spread in my Bullet Journal with this as a guideline. Pretty nifty resource I would highly recommend at least visiting. Besides being a handy resource, it's also fun to see their collection of found grocery lists. This way you'll have a simple collection to look through while crafting your grocery list. Categorize it to make it easy to view the different items at a glance in their own sections. 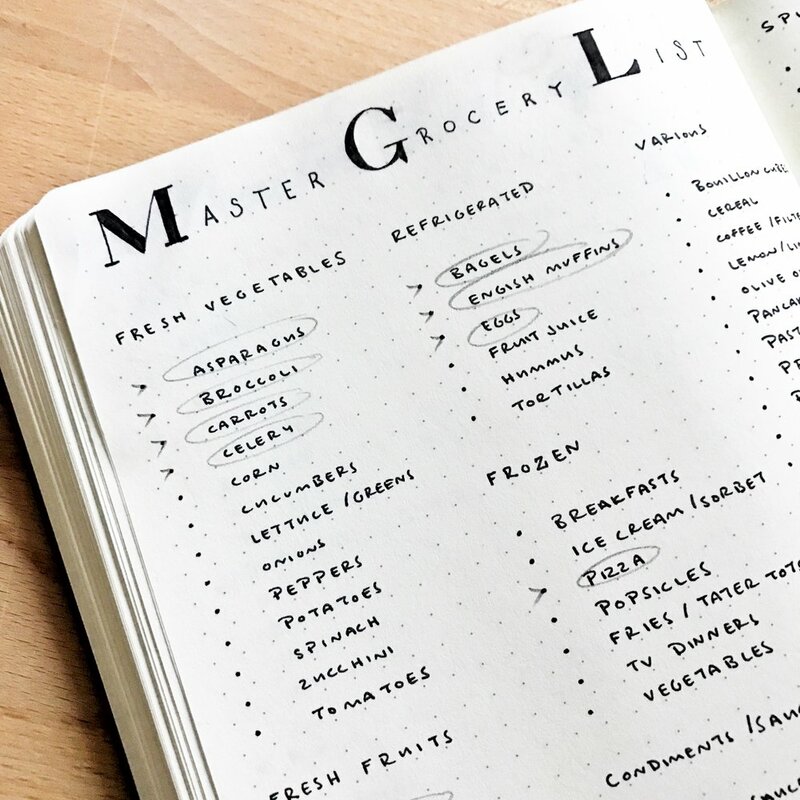 The brain loves a sense of order, and with our list-loving ways this is bound to tickle your list-loving heart with all the mini lists neatly organized. Here I created a simple list with a Staedtler pen. I've been loving serif fonts lately, here's the serif font alphabet I referenced. I think that's probably the main point of a Master Grocery List, to have only this one list. If you'd like to do this, you certainly could! You could use a pencil, I used a Blackwing 602 here, or you could use an erasable Pilot FriXion pen (which I love, by the way! They were what helped me ease into using pens). Circle the items you need and X them when you get them! This way you'll be able to use the list over and over again. An idea is to circle the items that you need and then migrate them over to your grocery list, for example I use the AnyList app because I share grocery lists with my sweetie, this is the method I use. Once you've added the items to your grocery list, you can reuse the list by erasing all the pencil, hooray! Here's a closer look at the Migration symbol. I actually really love color, it brings joy to my life. For the last few years I've really enjoyed the subtlety of pastels and couldn't resist grabbing these Zebra Mildliners recently after coveting them for a while. This will add that extra bit of fun. You know how much I love me a simple spread with a touch of color :) It makes me so happy to see this! Some of the links used in this article are Amazon Affiliate links, which means that if you make a purchase through them, I will make a commission at NO extra cost to you. Thank you for your support!